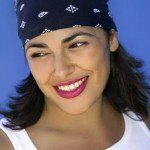 Bandanas – some rigorous activities require a more “locked down” solution and a bandanna can be the perfect solution when protecting womens hair color. For action like beach volleyball, cruising on a motorcycle or in a convertible or other action oriented activities such as boating, hiking, rock climbing or even working in your yard or garden, bandannas are great for protection and they exude and attitude. Wear a Swim Cap – when possible avoid chlorinated water. But, when you can’t, use a swim cap to keep the chlorine off. This is especially helpful if you swim regularly for exercise. Chlorine is one of the biggest challenges in protecting womens hair color. Combined with the suns UV rays, chlorine is part of a tough one-two punch. The swim cap is “golden” when protecting hair color. Use Conditioner – when you are going to be in chlorinated water and you cannot wear a swim cap, wet your hair with tap water and put conditioner in your hair prior to entering chlorinated water. This helps protect your hair from harmful chemical reactions. Go Jump In The Lake – Take this piece of advice literally. If you want to swim and can use a lake. The water is not chlorinated and your artificial hair color is safe. Shampoo Less – Shampoo is designed to get your hair clean. The same cleaning agents that remove dirt, sweat and other grime create the perfect hair color removal scenario. When possible, condition your hair only. Of course, if your hair is dirty and sweaty, shampoo it. But the more you can condition only, the longer your artificial hair color will last. Using a color lock hair spray is a great way to help the color retention process. There are a number of great products on the market for womens hair color protection. Look ‘N Good Salon recommends Paul Mitchell Color Protect Locking Spray to help lengthen the life of our customer’s artificial color. Not only does the product protect the coloring, it smells great and a bonus with this product is it makes your hair look conditioned and super shiny. Sunflower extracts provide sun protection and work to keep color from fading, adding moisture and shine. To get the complete story of womens hair color protection, call or come to visit the professionals at Look ‘N Good Salon. We’ll be able to help create and protect the look you desire.